Being a woman seems to be as much a tragic flaw in this telling as jealousy is, at least through the eyes of a most misogynistic Iago played by J Hernandez. 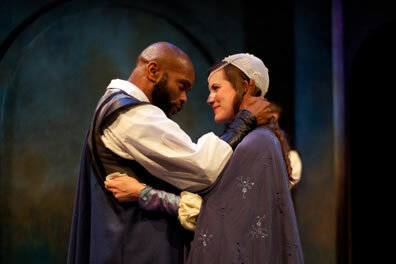 The Philadelphia Shakespeare Theatre, Philadelphia, Pa.
Othello (Forrest McClendon) puts his whole focus on Desdemona (Lauren Sowa) as they greet each other upon his arrival in Cyprus in the Philadelphia Shakespeare Theatre production of Othello. Photo by Chris Miller, Philadelphia Shakespeare Theatre. Othello is almost always considered the story of the Moor of Venice and Iago. Maybe it's time we also consider it the story of Desdemona, Othello's wife. In the Philadelphia Shakespeare Theatre's production, Lauren Sowa as Desdemona wrests some of the play's focus away from Iago's villainy and Othello's jealousy onto her plight as a brave woman who doesn't comprehend the danger she's in until the very moment of her death. That all of the play's women create a thematic arc in this production may have been director Carmen Khan's intent, but Desdemona's prominence owes as much to the exquisitely detailed performance turned in by Sowa. Khan immerses us in the world of 16th century Venice and its trading outpost in Cyprus, with richly rendered costumes from designer Vickie Esposito and a set that's both efficient and elegant in its simplicity from Lisi Stoessel. Light designer Maria Shaplin dramatically casts the set in moonlight, daylight, and their shadows. Khan makes no obvious attempt to conceptualize Shakespeare's text: Her production seems to be simply the tale of a villain who achieves revenge on his general by manipulating him into a deadly jealousy of his wife. Nevertheless, the second-class status of women in this Venetian society somehow seems more pronounced in this production than I've noticed before. Obedience is each woman's walking order, whether it's Desdemona transferring her duty from her father to her husband and remaining bound to her husband when safety dictates otherwise; or Emilia snatching up the handkerchief on behalf of her husband; or Bianca letting Cassio order her about and treat her as a toy. Being a woman seems to be as much a tragic flaw in this telling as jealousy is, at least through the eyes of a most misogynistic Iago played by J Hernandez. All three women in the play somehow fall victim to his abuses, directly (Emilia), indirectly (Desdemona), or by direction (Bianca). However, all of these women display an inner strength and wield power in their own way. Bianca's power is sexual; Alexandra Leigh just needs to let her leg show through the hip-to-floor slit in her dress to turn Cassio into putty. Eleni Delopoulos' Emilia spends much of the play cowed, starving for the affection she sees between Desdemona and Othello (Forrest McClendon), which is wholly absent from her own marriage with Iago. She flirtingly plays keep-away with the handkerchief, but Iago violently beats her down, snatching it from her as he commands that she "be not acknown on't"—this abused spouse will thus later maintain her silence when she sees Othello rage to Desdemona about the handkerchief. However, when the depth of Iago's villainy becomes clear to her, Emilia bravely stands up to him despite the inevitable danger to her person. Delopoulos' Emilia really blossoms when she converses with Desdemona in the bedchamber. She shows a saucy attraction for Lodovico, who has just come from Venice with orders for Othello, and holds a casual regard on the topic of women cheating on their husbands. "Wouldst thou do such a deed for all the world?" Desdemona asks. "Why, would not you?" Emilia replies, and Delopoulos makes clear that she assumes Desdemona would. But Desdemona is naïve to such notions. Desdemona is among the most problematic of Shakespeare's female creations. The strong-willed daughter who elopes with a Moor and readily embraces the life of a soldier's wife at the beginning of the play doesn't seem to square with the obviously sheltered lady who can't see a freight train heading right at her at play's end. Sowa found her way by first emerging as the daughter of Brabantio, played by Ralph Edmonds as a man of action and moral fortitude. The notion that Desdemona lived a sheltered childhood falters when you consider that Brabantio obviously ran a house that was open to all elements of Venetian society, including the exotic Moor. Sowa's Desdemona from the start displays some of her father's self-assured bearing and appreciation of Othello and his world. She also has an all-consuming love for Othello. "My love doth so approve him that even his stubbornness, his checks, his frowns have grace and favor," she tells Emilia even after Othello has publicly struck her. This Desdemona tolerates the abuse—at least for now—because she's trying to learn what ails him so that she can help him. I don't see Sowa's Desdemona putting up with the abuse a second or third time, but, of course, the second time is fatal. While we've been watching Iago spin his web, we need to remember that Desdemona is completely clueless to it. Even in the bedchamber, even as her death seems imminent, she reaches out soothingly to Othello, unaware of how McLendon's Othello can hardly bear to look on her, so much does he hate her. Sowa's performance of flustered frustration from the handkerchief scene to her ultimate bewilderment when she finally hears Othello's truth testifies how cleverly Iago has created a mental state in the Moor out of nothing more than carefully planted words. We also see why Desdemona, so pure and whole in her love for Othello, doesn't even realize she needs to defend herself until it's too late. But when it is too late, she tries—Sowa puts up a valiant fight as Othello strangles and smothers her, making for one of the most disturbingly violent Desdemona deaths I've ever seen. This may have been Iago's intent all along. Hernandez does not make his Iago in the least appealing. He talks to the audience, but not in a manner that would inspire us to desire his friendship; at one point Hernandez encourages the audience to applaud Iago's cleverness, but as written, Iago shouldn't need to invite our appreciation; we should be naturally enthralled in his villainy, for it is sublime. Rather, Hernandez's Iago comes off as a sour jerk or, to the women sitting beside me, just insane. He certainly has a big chip on his shoulder, even when he's in the company of the other characters, but what exactly makes up the matter of that chip is unclear. He obsesses over the rumor that Othello and his wife have had an affair, he is obviously bothered that Othello passed him over in favor of Cassio as his lieutenant (we see him seethe when the drunk Cassio in Cyprus pulls rank on him), but there also seems to be a subtext that Othello's marriage to Desdemona galls him as much as anything. This has less to do with race than the fact that he doesn't like women intruding on the soldier's life he's hitherto enjoyed with Othello. Othello has changed, to the degree that he appoints a "Florentine—a fellow almsot damned in a fair wife—that never set a squadron in the field" to be his lieutenant, and it would seem to this Iago that this change came about via Desdemona's influence. Even as he's purportedly providing solace to Desdemona, he maintains a reserved demeanor, as if he can barely stand to be in her presence. The brawl in Cyprus that undoes Cassio quite in Othello. 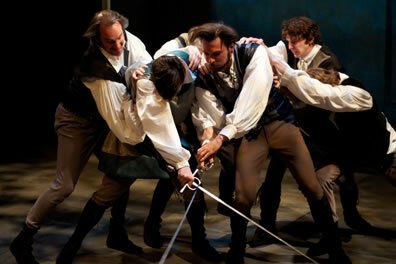 Crossing swords are Montano (Ian Sullivan, left) and Cassio (Chance Dean) as other soldiers (from left, Eric Van Wie, Johnny Smith, and Patrick Lamborn) try to break them apart. Photo by Chris Miller, Philadelphia Shakespeare Theatre. This may also factor into his loathing of Cassio. Chance Dean plays the lieutenant as a suave man of cultured manners, very much a lady's man, whether he's paying courtly courtesy to Desdemona or toying with the prostitute Bianca. He shows his gentlemanly courtesy to Emilia when he welcomes her to Cyprus and we get Shakespeare's curious line (as no stage direction accompanies it), "Let it not gall your patience, good Iago, that I extend my manners: 'tis my breeding that gives me this bold show of courtesy." In this production, Cassio merely kisses Emilia's hand; Iago's perturbation goes beyond that gesture, though. McClendon's Othello certainly is a man in transition, from the warrior to the social climber. Desdemona is teaching him how. Iago, though, takes over as his schoolmaster once they go back to the front lines. McClendon gives us a proud but yet uncomfortable Moor in the Venetian council scene and the confident general upon arriving in Cyprus, though it is Desdemona who becomes his sole focus after he arrives. He promises the Duke he would not let Desdemona distract him from his duties, but we see early on that he can't keep this promise: He delegates his authority to Cassio and Iago on the first night he's in Cyprus so that he can be with his wife, and she is able to get him to set aside his administrative duties when she first pleads for Cassio's reinstatement. This man caught between two worlds and lost in dotage on this gem of a Desdemona is ripe for Iago's psychological-borne revenge. "O, these men, these men!" an exasperated Desdemona says to Emilia in the bedchamber. Despite her keen intelligence and maturity, Desdemona simply can't comprehend what has come over her husband. But neither can he.